80% of businesses fail within the first 2 years. If they survive after that, most businesses never create enough momentum to fulfill their mission and dreams. On the other hand, 4 out of 5 businesses that are started by a business person supported by an experienced business growth coach are successful way beyond 2 years. They continue to gain momentum, navigate through challenging times that shut down most businesses, and fulfill their goals and dreams. How much of the dream on the inside of you is actually happening in your life? Do you ever struggle with blurriness of vision and confusion about your purpose? How about getting and staying focused on your highest priorities? What about breaking free from the gravitational pull that is keeping you from creating the momentum you need to move to the next several levels? Is life so demanding it seems impossible to create the proper work/life balance that allows you to prosper without damaging those you love most? Sadly, 4 out of 5 people go to their graves without ever fulfilling their dreams and sense of purpose. You are uniquely gifted and designed to create massive value to serve people in dramatic ways. You have big dreams. There are places you want to go and people you want to meet and interact with. The seed becomes a tree through growth and development. You are destined for greatness . . . to be a flourishing tree that provides an abundance of fruit, shade, strength and stability. How are you going to achieve all you want without sacrificing the relationships you care most about? How do you build a high performance team to support you in achieving your goals and fulfilling your dreams? Here’s one of the most important truths about your development process . . . Without accountability, nothing improves. Nothing. No exceptions. In other words, no one becomes great without an effective coach and mentor holding them accountable . . . helping them tap their unique greatness, embrace their powerful assignment and build an effective support team. With Tim’s wisdom and guidance, you will clarify your purpose and dreams, learn how to connect deeply in your key relationships, and stabilize and grow your finances and dreams. You will discover and remove key constraints blocking you from fully living your purpose passionately. During the discovery and strategy processes, we will provide you with powerful assessments that identify your unique strengths, talents, and other amazing aspects of your gift and skill mix. This is not just more information, because we work with you and these findings to fine-tune your strategies and action items to gain the results you desire. Tim has coached a variety of leaders and organizations from diverse industries worldwide and helped them achieve growth rates up to 50% and beyond. He helps you to identify and remove the core constraint that hinders progress. Then, he shows you how to create and implement key steps and systems that lead to significant growth. With Tim on your team, you can have a confidential expert to interact with throughout each month. He works side by side with you in your dreaming, planning, implementation and ongoing decision-making. It’s like hiring a high-priced, seasoned executive for a fraction of the cost…with returns that pay the investment back many times over. 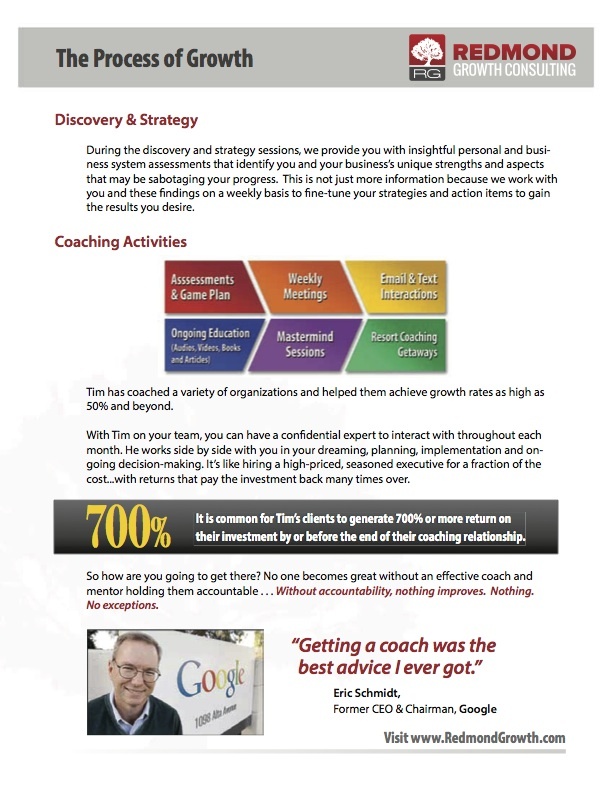 It is common for Tim’s clients to generate 700% or more return on their investment by or before the end of their coaching relationship. Is it time to make an investment into your life and dreams that will really make a difference? 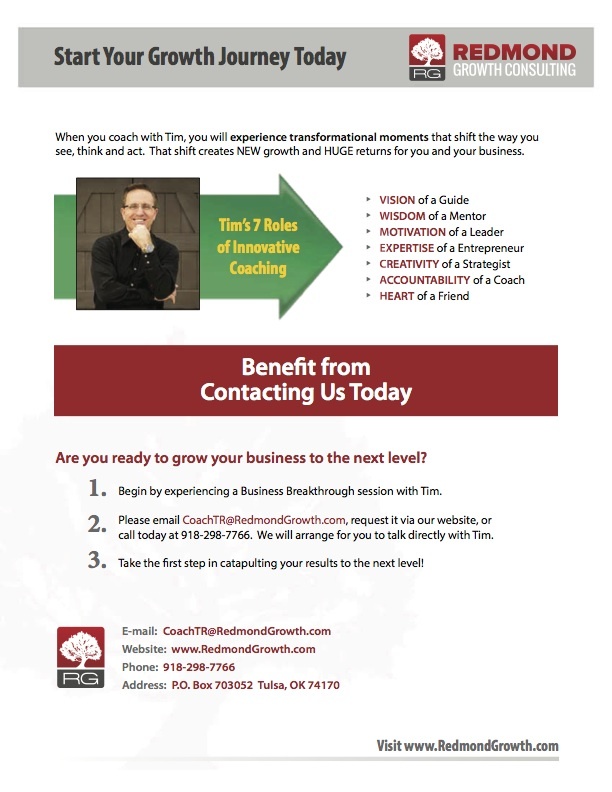 Tim Redmond, a top Tulsa Business Consulting expert has developed 7 stages to his effective coaching system. 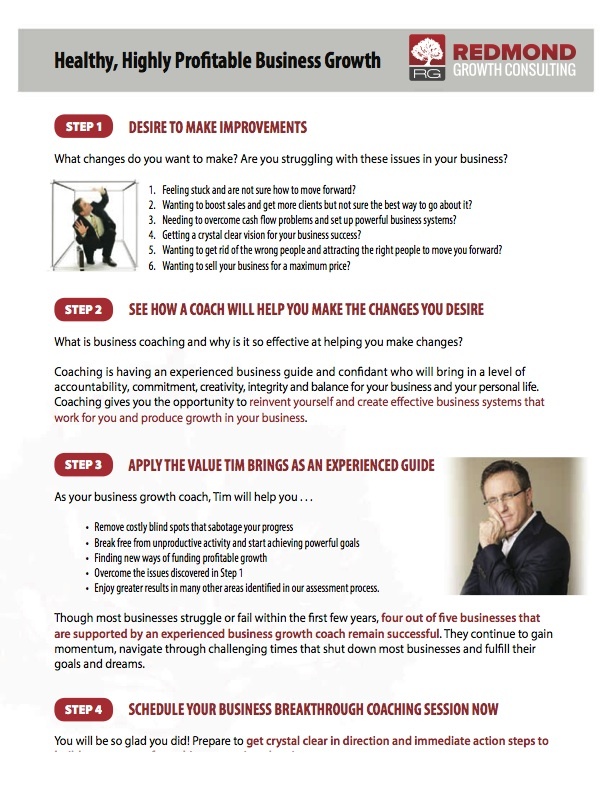 By understanding each of these stages and applying them to your business, you will have a clear business coaching growth pathway. The first stage of the Tulsa business coach, Tim Redmond, asks this question, where is my vehicle taking me? Your vehicle is your business. Whether you are in manufacturing, financial services, retail, restaurant, hospitality, medical or healthcare provider or any other number of industries in which Tim Redmond has served, it is vitally important to know to have a destination or target that your business vehicle is taking you. When one makes it abundantly clear where their business is bringing them, several crucial processes are engaged and start working for the business owner. One of which is your faith. When you create a destination, a target, a desired result, you activate your faith to call those things that are not as though they were. Your faith directs you to take small steps (and when needed, large leaps) to attain the future results. In addition, the resources needed become clearer as does the means of obtaining those resources. The second stage of Tim Redmond’s effective coaching pathway asks the question, “Will the vehicle take you there?”” Does the vehicle have the capacity, the means, the profits to take you to your desired destination? If your destination is making $10,000 in profits each month and you sell widgets and only generate 10 cents per widget sold, you’ll have to sell 100,000 widgets each month. If the best month you’ve ever had was selling 6000 widgets, it becomes clear that the vehicle, at least in the shape it is now, will not be able to bring you to your desired result. 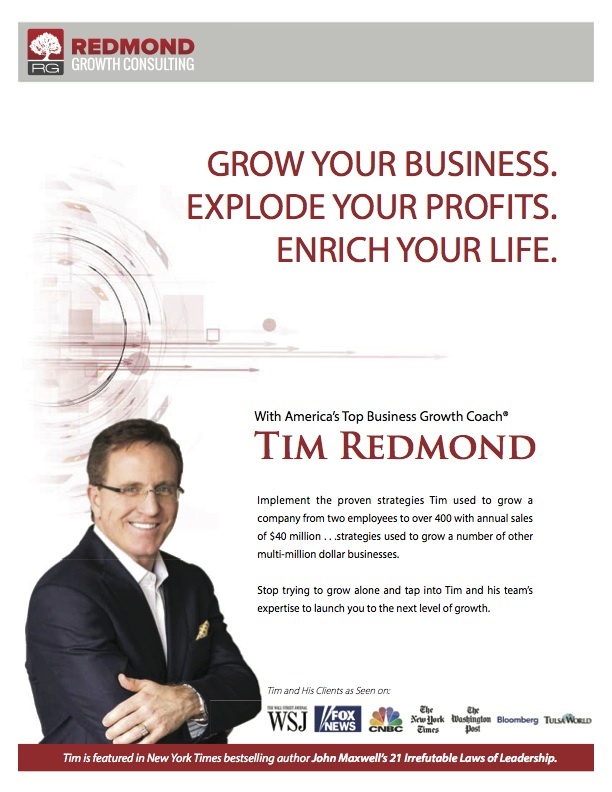 In Tim Redmond business coaching model, he will help you redesign your vehicle to increase the leads, sales, and profits to win, to achieve and exceed the $10,000 per month goal. This is a fascinating process and one many business owners are not consciously aware of nor do they know how to change what needs to be changes so they can win. Tim Redmond finds it is common that business owners undervalue the value they create. In other words, they price and package their products and services for less than the market is willing to pay. Another aspect of redesigning the vehicle is challenges the costs involved in the cost of goods sold. There are a number of powerful strategies and action items that Tim Redmond and his team help CEOs implement to reduce the costs of goods sold. One of the biggest ways to improve business performance is increasing quality leads and increasing the conversion rates. In other words, increasing profitable sales. This is one of the biggest shortfalls in businesses in all industries. 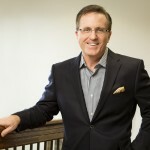 This is on of the key expertise areas of Redmond Growth Consulting and Tulsa business coach Tim Redmond helps businesses improve. 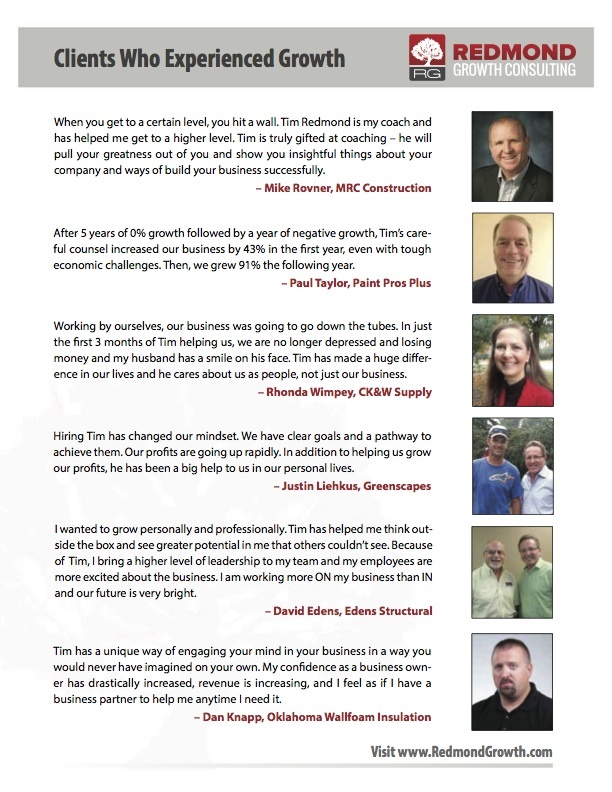 It is not uncommon for Tim and his team to help companies double their sales in the first year or two of coaching them. The third stage of the top Tulsa business coach incorporates with business owners asks the question, “How can I use my time for the highest and best use to focus on completing my priorities?” Many refer to this as time management mastery. This is an area that business owners and entrepreneurs rated themselves low on a scale of 1 to 10; many times, the lowest of all the areas they are rating. What are the secrets of time management and implementing priorities that wealthy people use that the poor and middle class people ignore? The keys to effective time management begin with a clear target and priorities to achieve that target. Then effective leaders allocate how many minutes they want to spend on each given priority. Then they do what few actually do; that is, they assign those priority time blocks on their calendar. They then print out their calendar and carry it with them . The fourth stage is a significant stage that is worthy of an entire book. 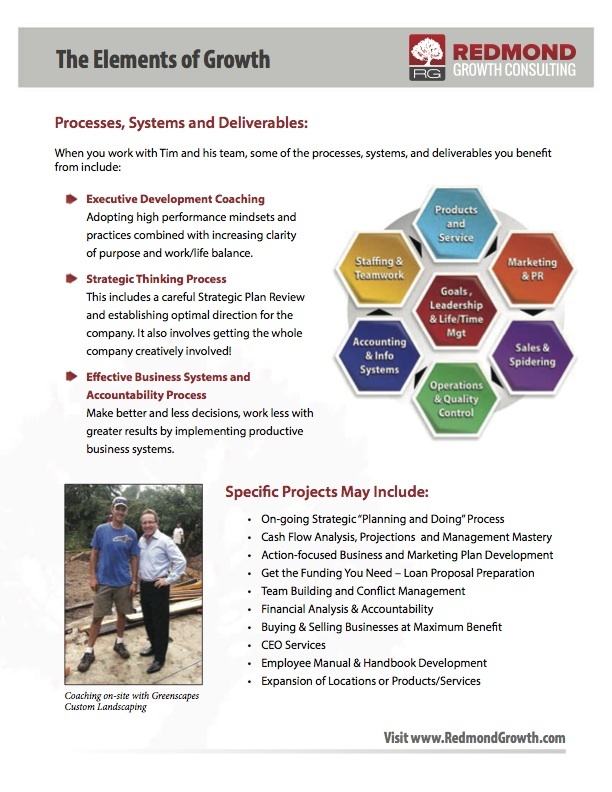 It asks the question, “What business systems needs improvement and what specific steps are needed to improve that business process?” Tim Redmond and his Tulsa business coaching team identifies the weaknesses in each of the systems then works with the business owner to make improvements in these systems. It is in this area that the top Tulsa Business Consulting team sees the most significant results in the shortest amount of time. Without getting a clear evaluation of each system leaves significant profits and productivity on the table. The fifth stage focuses on the effectiveness of the leader. It asks the question, “Are the elephants being addressed on a timely and effective basis?” What are the elephants? They are the issues that are not being addressed and resolved. In the name of politeness or fear of a negative response, cultures in so many businesses avoid talking about the elephants roaming the halls. They slow or destroy progress. They blind people of seeing and acting upon the amazing opportunities. It creates a system of over-sensitized politics rather than a focus on creating results. The sixth stage asks the question, “Is leadership and accountability set up to lead and hold everyone in the organization to a high level of productivity and teamwork. Is there a clear leader in each department with a clear process that holds employees in that department accountable for specific results on a daily basis? Without accountability, nothing improves. Ever. This stage is key to moving the organization to a self-managing one that is NOT reliant the owner or executive director. 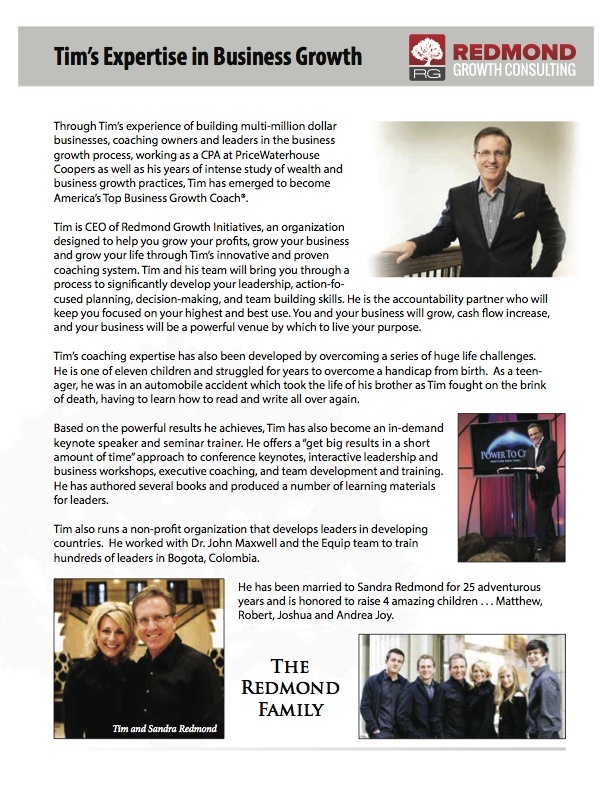 The seventh and final stage of Tim Redmond, the leading Tulsa business consulting expert asks the question, “How do I handle the growth or success?” It is amazing to see how some business owners are not mentally or emotionally ready to handle the level of success into which Tim Redmond leads them. When the outside results are different from the inside “comfort zone” or internal reality (what one things is the reality that they are comfortable with), they will consciously or subconsciously work to create alignment of the outside results to match the vision of what they are most comfortable on the inside. Psychologists refer to this as a setpoint. Tim and his team works with an organizations CEO and leadership team to move their internal setpoint to be comfortable with the positive results their business is producing. 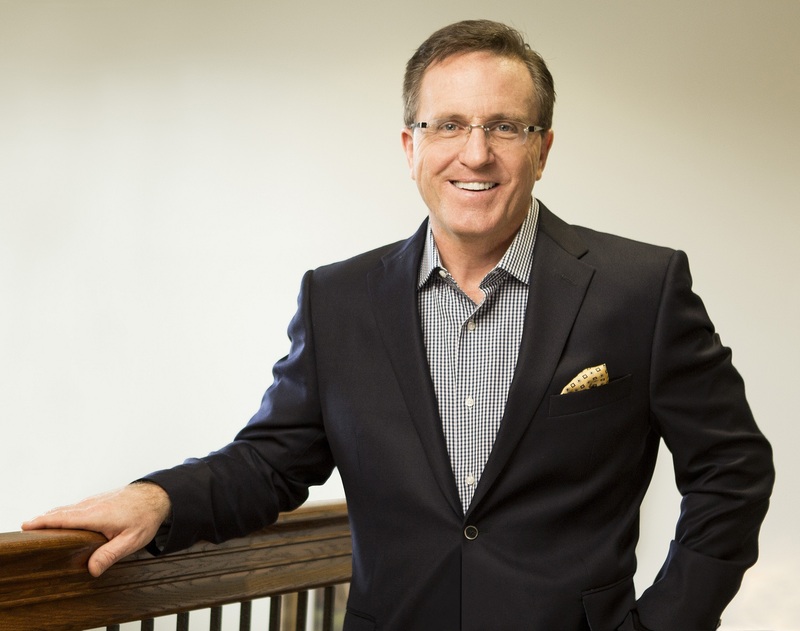 To experience the powerful results that each of these seven stages of Tim Redmond’s Tulsa business coaching system, begin with his insightful Business Evaluation. The owner gains insights into his business in a way he or she has never seen along with concrete steps to implement the growth strategies that the Business Evaluation identified.